I’ve been reading some really great stuff lately. I’m nothing if not a sharer so I thought I’d give you a few links to peruse. But first, let’s start with a pretty picture to give you a little mind break before we begin. 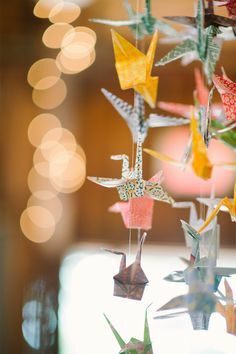 I love paper cranes. Leigh linked to this great article that I recommend you read too. I loved this writer’s perspective about being a stay at home mum and the simultaneous joy and horror it brings. The crux of this article though is about the type of questions we ask each other. The writer suggests that a caring question is like a key that can unlock a room inside the person you love. Generic questions are kind of like generic gifts, whereas caring questions are more like thoughtful gifts. If we really want to know each other, if we really care about people, then we need to ask them better questions and really listen to their answers. I want to try and be better at asking the people I love good questions and really listening to how they answer. New goal! I came across this funny post by a food blogger about the 10 food blog trends she think should stop. It made me laugh. In particular, I love her comments about people trying to ‘paleo-ise’ every recipe. Guilty! I thought this article about how birth order can affect you personality was interesting. I wonder if my niece, despite being the 4th child in her family, will actually behave more like a 1st child because of the big age gap between her and her siblings. If you’re the eldest child in your family, do you have the traits described in this article? I think I do. I have always been a fan of quizzes. Back when I used to buy magazines, they were one of my favourite parts! I’ve done a few online lately that were fun including this one, based on the Harvard Dialect Survey. It guesses where you come from by the types of words you use. It’s US based but was interesting none the less. Apparently I sound like I’m from New York, Providence or Honolulu! I’m actually not sure whether that is good or bad! You can do this quiz to test the extent of your vocabulary. I recognised a lot of words but I couldn’t define them all so overall I was a bit disappointed in my score. Do it and tell me how you go! But no cheating! In this test, I was very happy with my score! It’s about seeing how well you can read people’s emotions. The theory behind this piece of research is that people who read literary fiction rather than popular fiction are generally better at reading emotions. Apparently this is because literary fiction often leaves more to the imagination, encouraging readers to make inferences about characters and be sensitive to emotional nuance and complexity. Fascinating! And then there’s this little personality test. It consists of just one picture and confirms for me that I am most definitely an introvert! If you have time, read this long, but amusing article about the radical honesty movement. I always thought I liked honesty until I saw that Jim Carrey Liar Liar movie. It terrified me! So did this article! I think I’d actually prefer a world of white lies over radical honesty. And for all the wanderlust out there (that’s me! ), here’s the New York Times list of 52 places to go in 2014. It’s so nicely written. On the list, I’ve been to only 6 places; Christchurch, Scotland, The Vatican, Athens, New Caledonia & Vienna. Having read this list, I think a third trip to Scotland is in order so I can do the 8-12 day walk across the country! I also like the look of Indonesia, Iceland, Serbia, the Seychelles and the Faroe Islands. I also liked reading about how the travel writers pick the places for the list above. Have you read anything lately that you can share with me? Add your links below! According to those tests, I’m an introverted cross between the middle/youngest child (my oldest sister is an only child! ), I have a vocab of 25,100 words and a Providence/New York/Yonkers (?!) accent. I love, love LOVE this post! I’m sitting here waiting for the man to come back from the LAN, trying really hard to ignore all the horror movies on my hard drive and BAM! I see this. You find all the best things on the interwebs. I am the younger child and I had to chuckle at that road trip story. I think different parts of my personality mean I’m too prepared for the jacket scenario, but can relate to everything else. My fam also puts me in that position so that’s an interesting perspective too ie how the elder sees the younger, which doesnt seem to change with age and vice versa. Ok so according to that quiz I should be living in NYC, or Fort Lauderdale then Pembroke Pines. Weird. Strange our Aussie accent seems to be similar to NYC…which I did not think was the case while in NYC. I got 24,900! Some of those words I had honesty never even seen or heard of. I loved the emotion one! I got 30. Some were really hard…but it helped to go with my first instinct and not second guess. I love that graphic. I have no clue what I am anymore. Most would classify me as an extrovert, but I also like my own company. I relate to both at different times. I’ve only been to 3 of those places! Krabi, Downtown LA and The Vatican. Well, you know what this means…..although I have to say not too many of those appealed to me. I think I’m firmly a on the beaten track kinda gal. And not ashamed. Waiting for the man to come back from the LAN. Love it! With the vocab quiz, I feel better about my score now, knowing that both you and Sheela were also around the 25,000 mark. I felt like I should have got 30,000 plus but maybe that’s unrealistic! I think in my fantasies, I’m an off the beaten track kind of girl. But when it comes down to it, if getting off the track translates to lowering my hygiene standards, then I quickly loose interest. Wow! Have just opened heaps of links and am off to do some reading. And some tests! Oh Neen you make me laugh. It is quite scary sometimes how alike in thinking we are about all kinds of things. I just did an online quiz this morning to test my grammar skills. I was slightly disappointed that I only got 7/10 but they were tricky ones! Ha, yes we are alike! I’m going to go now and do that quiz on the Plain English Foundation site.